Thomas A. Shay violated parole. He managed to evade capture for a year. But yesterday, Thomas A. Shay was literally caught sleeping. The fugitive, who spent 10 years in prison for planting a bomb in 1991 that killed a Boston police officer and wounded another, was tracked down at his mother's house on Beacon Street in Quincy by deputy US marshals, Boston police, and Quincy police. "Everybody in his family said he wasn't there," said Supervisory Deputy US Marshal Jeffrey L. Bohn, adding that a quick search of the two-family house showed that they were not telling the truth. "He was upstairs in bed." Shay, 35, was pulled out of bed at about 9:30 a.m. and arrested without incident, Bohn said. "He should be locked up," said Thomas J. Nee, president of the Boston Police Patrolmen's Association. "We're thankful someone else wasn't maimed or even killed. The kid doesn't belong out there, free. We've been very disturbed that he was out on the street." 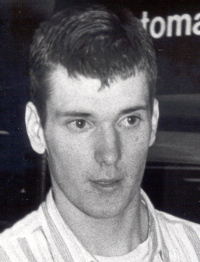 Shay was convicted of plotting with a friend, Alfred W. Trenkler, to make a homemade bomb, which was planted under Shay's father's car and exploded when members of the Boston Police Bomb Squad were examining it in a Roslindale driveway on Oct. 28, 1991. Officer Jeremiah J. Hurley Jr. , 50, a father of four, was killed in the blast, and his partner, Officer Francis X. Foley, lost an eye and was never able to return to his police job. Trenkler, 51, who had been serving a life sentence, had his sentence reduced in April to 37 years. Since Shay's release from prison in August 2002, after serving 10 years, he has repeatedly violated the terms of his federal supervised release, which require him to stay out of trouble or face up to five more years in prison. In late 2005, he was sent back to prison for four months after assaulting a Northeastern University officer and leaving a halfway house. A fugitive warrant was issued for Shay Aug. 1, 2006 after he was arrested in Spencer on state charges of selling drugs to one teenager and stealing from another. Shay allegedly fled to avoid going back to prison for violating the terms of his federal supervised release. The US Marshal Service had searched for Shay in New Hampshire, Maine, Chicago, and parts of Massachusetts, and marshals were about to participate in an interview on his case this week with Fox TV's "America's Most Wanted" in a bid to boost his profile, Bohn said. But that plan was scrapped yesterday, when deputy marshals learned he had returned to the area a couple of days ago and then located him at his mother's house. Though it was believed that Shay had been dressing as a woman to disguise himself while on the run, Bohn said Shay denied that after his arrest. Yesterday, Shay was dressed in men's clothing -- blue jeans and a navy-and-white striped jersey -- as he was escorted into federal court in handcuffs and shackles. US Magistrate Judge Marianne B. Bowler ordered Shay held without bail, pending a hearing July 24 before US District Judge Rya W. Zobel, who presided over his trial, on whether he should be ordered back to prison. During the brief hearing yesterday, Bowler quizzed Shay's lawyer about the marshals' assertion that Shay claimed to have suffered a seizure while locked up at the courthouse yesterday and that he had refused medical treatment. "He's telling me that he didn't really refuse medical treatment," said Page Kelley, a federal defender who represents Shay, adding that he told her he had suffered a seizure, but was OK and eager to go forward with the hearing and resolve the new charges. "He told me he had been wanting to turn himself in," Kelley said.